A Celebratory lunch was held at Holy Trinity church to herald the end of a two-year history project. It was the end of an era as the congregation and partners in Holy Trinity’s project, ‘Heritage at the Heart of Sutton Coldﬁeld', came together for a feast in the historic church, on Church Hill, of Mill Street, last Sunday (February 3). The project, made possible thanks to a £96,000 grant from the Heritage Lottery Fund, has enabled a stewarding programme to beset up, the creation of a new church website with a large history section, and a wealth of resources to support visitors to the Grade I listed building. Project co-ordinator Stella Thebridge said: “It was great to see so many of our supporters last Sunday. 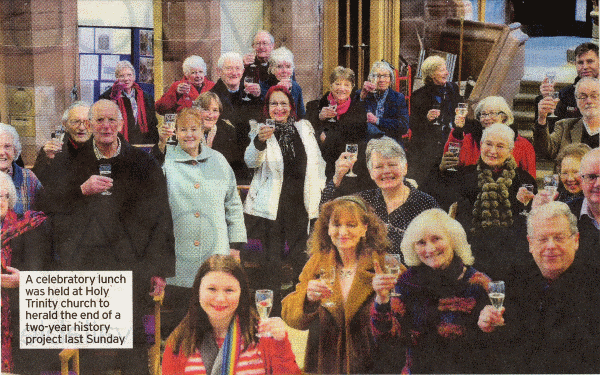 “We had a glass of ﬁzz to toast the future of the church and everyone who has contributed in some way to the project has received a special ‘thank you’ badge using the project logo. The church will open again every Tuesday and Thursday from February 19, and on some Saturdays. Visitors are always welcome, old and new, and a cuppa is always available. ℗ First published in the Sutton Coldfield Observer, February 8th 2019.